On Sunday night The Fringe Dwellers did a trio show – their first gig since Mal’s enforced stay at Nubeena and the Tasmanian Bushfires. 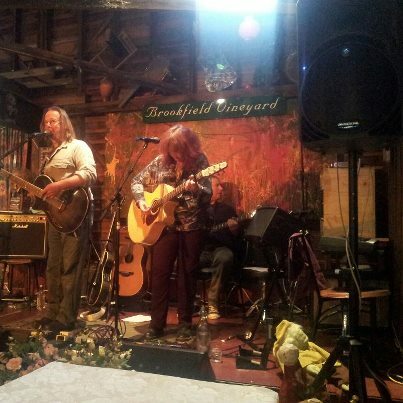 It was held at Brookfield Winery at Margate, just south of Hobart. Two stages, loads of acts and huge hearts all round. At last count these amazing folks raised $4500 for the local St Vincent de Paul Society – brilliant effort! Next weekend, we go to full band mode down at the Dunalley Hotel for Regrowth: Bushfire Relief Concert for Tasman & Dunalley. This will be bringing it on home for Mal and many of our friends. Dave Campbell the gig organiser (also a local) is a powerhouse and has managed to get everything from kid’s entertainers through to full bands. He’s also accessed shuttle buses so people don’t drink and drive – awesome work man! If you’re in southern Tasmania please come down and join us, we really want to thank everyone who’s been so supportive over these difficult days.